As Irish castles go, Mount Falcon is a relatively recent addition, dating back to the late nineteenth century. This means it’s not wedded to any specific historical details, though, which can arguably be a strength. Imagine adding a range of detached self-catering lodges to a thousand-year-old castle, and the word “sacrilege” comes to mind. In Mount Falcon’s case it’s just a sensible expansion, and a new twist on the tradition of Irish country hospitality. The old house’s four original rooms and the two deluxe suites are classic in style and lack for no reasonable luxury — for decades Mount Falcon’s guests, a discerning bunch, found them more than satisfactory to requirements. 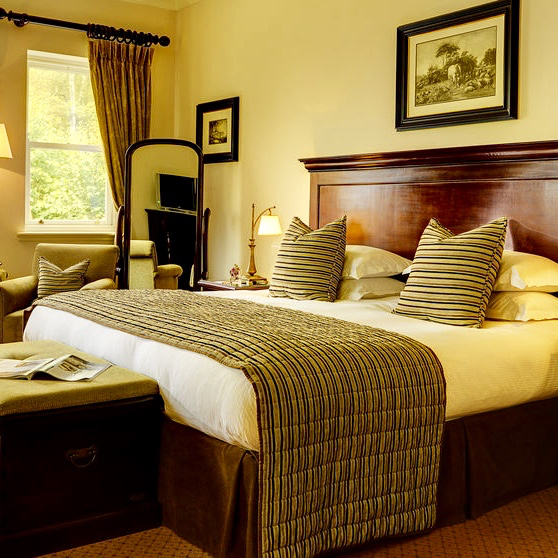 The expansion adds twenty-six superior rooms, which are stylistically quite continuous with those in the old house, and though newer, no less comfortable or attractive. On top of that, a number of one-, two- and three-bedroom lodges expand the offering beyond the traditional hotel paradigm. What they lose in old-castle romance they gain in privacy, residential atmosphere, and practical details (read: fireplaces). Of course the accommodations are only half the story. Once you’ve said everything there is to be said about the rooms, you still haven’t touched the grounds, the golf, the fishing, or the spa and it’s heated indoor pool — to say nothing of the kitchen, whose modern interpretations of traditional local ingredients show Irish cooking in its best possible light. Mount Falcon is approximately a 30 minute drive from Ireland West Airport Knock (NOC), 3 hours from Dublin, and 1 1/2 hours from Galway.